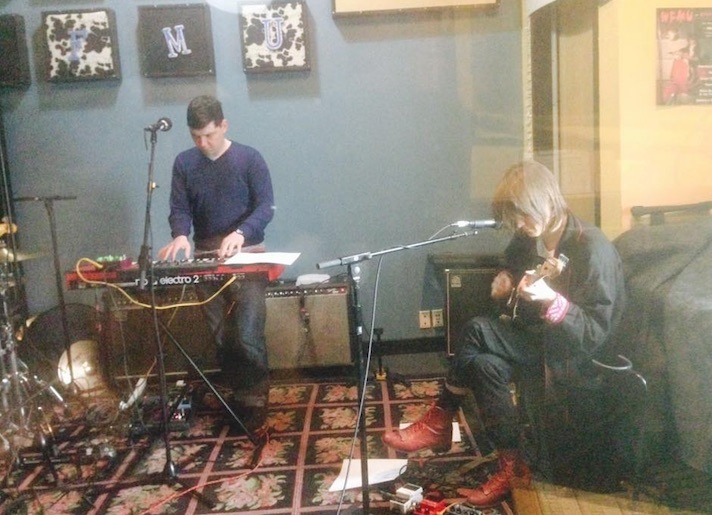 Cate Le Bon and band Live on WFMU. Band: Cate Le Bon (guitar, vocals); Stephen Black (bass, guitar, vocals); J.T. (keyboards, guitar, vocals); Daniel Ward (drums). Engineered (and photographed) by Mario Santana. Good morning, Joe and surface-dwellers. Boing boing! Hiya, Joe, and all Inspectors McGaskets listening in. I suppose if The Fall ever stops being, it would become the Felt? The goodest of good mornings to you all and thanks for tuning in today. Always great to hear you over the air, Joe. The crackles and drifting authenticate the experience. Sean G. reminds me to mention that my special guest today around 11 a.m. will be Cate Le Bon. She came in last Thursday and we had a really fine live session and chat. I hope you'll stay tuned for that! @sphere: diggin' your personal statement. Why does Garfield hate Mondays? Pretty sure every cat gets to sleep until 1 PM regardless of the day. @Guido: Much different experiences, I imagine! Mood will determine! Hello Gang! It's NOT Raining This mOrning! Yea!!! Never buy an antique harp. Classics IV did Spooky *and* Traces. Also Stormy. @tomasz Anyone that obsessed with lasagna couldn't be a nihilist. I will face the same conflicting conundrum on the 30th, Guido. @tomasz: Good luck with the new flat! @Parq: Thanks for reminding me, I wasn't sure. The mind is deteriorating at a remarkable pace. parq, i read somewhere that the classics album is the ur-document of soft rock. i just love this Smiths song always. What I couldn't remember is who did Sunny. Turns out it was a guy named Bobby Hebb. Yayson, soft rock *wishes* it has what the Classics' stuff had. Always loved the squeeze box in this song. even the Classics couldn't top themselves. They became Atlanta Rhythm Section, and were never the same. Although not as bad as Ambrosia's drop from "Holding on to Yesterday" to "How Much I Feel". When Morrissey did an upbeat track it was like the sun came out after a week of rain. I think I already want to hear that Eerie Wanda song again. @Will: I've played track 1 and now track 2. Maybe I'll just continue to play it in order. Telephone! Such a great song. @Scott: I did them and I don't think they regret it! At least not yet. What a song to wake up to the first full day of finals week! One can really see where Gordon Gano got his singing style. @pantz: I never noticed that before and you're SO right! This is nice Monday music, Joe. Thanks for the pick me up. And thanks again for your help with my S4L! This rock is so soft! hey joe. good to hear your show. it's doing its best to turn my morning around. Here we have a real-time loop of Mercury cutting in front of the sun today. It's a little dot going left to right about 1/4 from the bottom. mercurytransit.gsfc.nasa.gov... You can see also see some surface noise from solar flares and whatnot. @Ken: Surface noise with solar flares sounds pretty good to me! Chip Taylor channeling Dan Penn on that one. These sets absolutely fit the gray, damp morning here. A gray and damp day keeps wildfires at bay. It's a beautiful day to be alive. A beautiful morning not to commit suicide. The Sun is brought you today by.... Surface Noise and Joe McGasko. Thanks Joe! "Marmalade thighs and Maxwell House eyes" still in my top ten of favorites lyrics. Speaking of, an adjuster once told me, if a person doesn't have a porch to pee off of, that's one less fire prevention measure. I love that Buckingham wrote about having formerly been "somebody" before he became "somebody." Brian, I've got that covered. During dry season, you can ply your friends with beer. We need to hear that *clack* of the platter dropping, Joe. Ambience. Ambience! Kelly Jones!! @Brian: Platter sizzle is such a lovely sound! Strangely, I was in France in 1981, listening to ZZ Top. I still associate the scent of Bas Provence with swaying beards. What? A love ballad from ZZ Top??? @pantz: Men with beards have a sensitive side! @Ear Hammer: That's a shibboleth, to be sure. Thanks for playin 'Waitin for the Calvary' Joe. I sat in on that session for recording school RIA. Hold on, isn't that supposed to be Waiting For The Cavalry? Whatever happened to the film adaptation of Tommy James' book? I adore your show - so much great music! Could you list the music you speak over? - it's always interesting. Thanks! @brian outmoded is my main speed. Every day is Crab Day in my book. Diary is no Aubrey, but still an excellent choice. Many thanks for Cate Le Bon Joe. New to me and very nice. In my head a mix of Nico, Hermine and the Young Marble Giants. You bet, tadpoles, glad you enjoyed it! What @tadpoles said. Also reminds me of Stereolab a bit. Belated hello Joe. Are Cate's song titles a little self deprecating? @pantz: All kinds of influences in there! @Brian: Very possibly! She seems to have a sense of humor about herself and the world. Bit of a dog day afternoon over here. Glad to have heard Surface Noise this morning. Thx, Joe, and see you a little farther down the road. Thx, Sem, glad you enjoyed the listen! If you need help with pronounciation Joe my wife can help. Trouble is she is at work. Lovely. Thank you for today. @Brian: I'm not even going to fake it! @Brendan: Glad you enjoyed! Donna was always the most versatile of The King Sisters. Thanks for listening, everyone! Have a great week! Thanks for getting me a through another Monday, Joe! Hey, loving the Cate Le Bon. Thanks!